Artist’s rendition of SES Network’s O3b mPower constellation. Credit: SES. WASHINGTON — SES says its constellation of medium Earth orbit O3b satellites now has the ability to expand from an equatorial system to a global system thanks to new approvals from U.S. telecom regulators. On June 8, SES said the U.S. Federal Communications Commission approved the Luxembourg company’s request to sell satellite connectivity services in the U.S. with 26 additional O3b satellites. Those satellites would operate in both inclined and equatorial orbits, expanding O3b’s coverage from its present 50 degrees out from the equator all the way to the poles. With 16 satellites already in space, SES’s new authorization will permit it to operate a total of 42 satellites in medium Earth orbit. The new satellites will include four more first-generation satellites built by Thales Alenia Space for launch next year on an Arianespace Soyuz, 10 satellites in inclined orbits, and 12 satellites in equatorial orbits. SES said the FCC approval enables the company to “triple its next-generation O3b mPOWER fleet” for which Boeing is building the first seven satellites in anticipation of a 2021 launch. Each O3b mPower satellite has more than 10 times the capacity of the first-generation satellites, according to SES. The first seven are estimated to provide some 10 terabits of total throughput. SES, when announcing O3b mPower last September, said the first seven satellites would cover 80 percent of the Earth’s surface, but would not be limited to that coverage footprint. SES operates the O3b satellites in 8,000-kilometer orbits, roughly a fourth of the distance to Earth compared to geostationary satellites, enabling significantly lower signal lag. 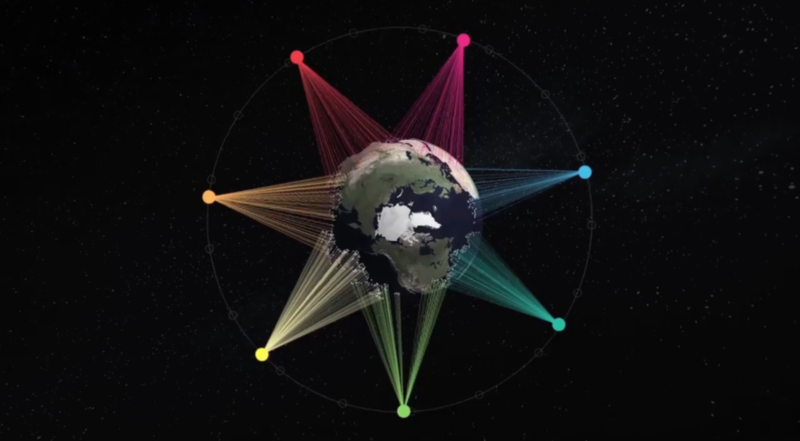 To date all of SES’s O3b satellites operate in Ka-band, using high-throughput spot beams for broadband connectivity and network services. The FCC’s approval included rights to six satellites with higher frequency V-band — a region of spectrum satellite operators have been testing for commercial use. SES is the second company to obtain FCC approval for V-band satellite communications following Hughes Network Systems in March. Other companies including Boeing, Viasat, SpaceX, OneWeb, Theia Holdings and Telesat have also requested authorization for V-band satellite systems. SES’s application for new O3b satellites faced opposition from Iridium, Telesat and Viasat. Iridium petitioned the FCC to deny SES’s application because it included access to some frequencies designated for mobile satellite services operators like Iridium. Mobile satellite services operators and fixed satellite services operators are losing their distinction as operators of both kinds seek to provide data services to the same platforms such as aircraft, cruise ships and oil rigs. Canada-based Telesat asked the FCC to give priority to operators who have earlier spectrum filings with the International Telecommunication Union. Such prioritization would give Telesat, which is planning a low Earth orbit constellation of 117 satellites, first rights to certain Ka-band frequencies over SES. The FCC rejected Telesat’s proposal, but stipulated that SES comply with the commission’s spectrum-sharing rules. Viasat voiced concern about O3b signal power levels and the risk they could interfere with geosynchronous satellites. The FCC said a newly adopted rule requires satellites outside of the geostationary arc not cause unacceptable interference to geostationary satellites providing fixed data or broadcast television services, and conditioned SES’s authorization on obeying this rule. SES’s O3b satellites must also adhere to any future power limitations the FCC — and to an unspecified extent, the ITU — sets on V-band, the agency said.